A bigscreen adaptation of "Gulliver's Travels," with Jack Black taking on the title role of Lemuel Gulliver, a free-spirited travel writer who, on an assignment to the Bermuda Triangle, suddenly finds himself a giant among men when he washes ashore on the hidden island of Liliput, home to a population of industrious, yet tiny, people. Download Gulliver's Travels in Digital HD from the iTunes store. Gulliver's Travels images are © 20th Century Fox. All Rights Reserved. 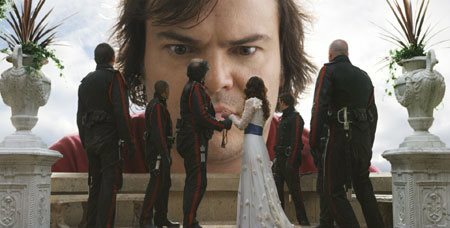 December 2010's Gulliver's Travels starring Jack Black (School Of Rock) comes to Blu-ray and DVD this April based loosely on the classic novel by Jonathan Swift, the film takes many liberties with its source material, and really the two are intended for completely different audiences. Though certainly a a family film, and one that you'll want to watch with the kids (if you decide to watch it with them at all), there is some vulgar comedy so use discretion. Jack Black plays more or less the same character he has played in every Jack Black movie ever released. Lemuel Gulliver, A slacker with a dead end job, child like attitude, with no real motivation to get ahead. Working in the mailroom of The New Tribune he soon falls for the female travel editor. To shy to ask her out, he makes a up a lie about being an avid traveller and wanting to write an article. After plagiarizing the article from the Internet, Gulliver wins the job which is a trip to write about "The Bermuda Triangle"...of course...Once there things on the boat awry and Gulliver finds himself on the island of Liliput where the inhabitants are only 6 inches tall. Gulliver awakens to probably the most iconic scene when one thinks of Gulliver's Travels of him being tied down by the inhabitants which quickly leads him to be locked away into slave labor. Just as quickly, Gulliver is able to save the princess from attack on the small island and becomes a hero and a "rock star." He begins claims that where he was from he was president and, describes his normal life through various pop culture movie references. There are some vulgar and unnecessary scenes such as Gulliver having the bright idea to put out a fire in the town by urinating on it (and people) but for the most part the jokes are lighthearted and not meant to offend. A war between two groups on the island ensues with Gulliver defending the city against a giant robot who has it out for Gulliver. There are a few separate love stories going on as a backdrop and a friendship between Gulliver and one of the common men, which help the comic relief and "feel good" theme to the film. The Blu-ray release includes of 90 minutes of bonus features including a gag reel, deleted scenes, short featuettes, and several features from Fox Movie channel. And as is common nowadays also includes a DVD and digital copy for your computer or mobile device. 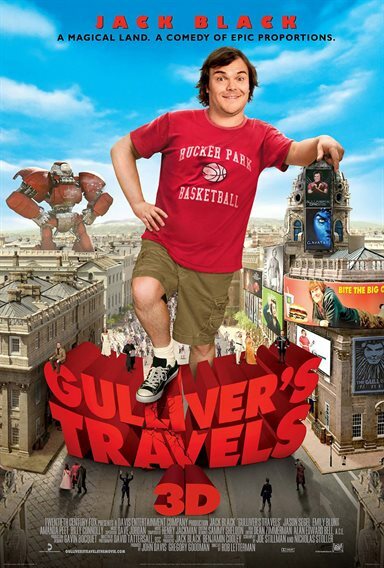 Gulliver's Travels was not very well received in its initial 2010 Christmas day release. However many movies find a cult following on home video. Unfortunately Gulliver is a little a too big for his britches. I would recommend this movie to a a 9 or 10 year old as a diversion on a Friday or Saturday night, while it is entertaining with plenty of action, the story isn't very memorable and the adults in the family will probably fail to see the appeal. Gulliver's Travels images © 20th Century Fox. All Rights Reserved.